Was Mars too salty for life? "weather station." Click on the image for a larger version. Life on ancient Mars just got tougher. Not only was Martian water highly acidic in ancient times, but it was also extremely salty, researchers reported today in Boston at the annual meeting of the American Association for the Advancement of Science. "In fact, it was salty enough that only a handful of known terrestrial organisms would have a ghost of a chance of surviving there when conditions were at their best," Harvard biologist Andrew Knoll, a member of the Mars rover science team, told reporters. When you add in the earlier findings about how acidic Martian water was, back in the era when the rocks now being studied were formed, the picture of the Martian environment becomes so forbidding that Knoll couldn't think of any organism on Earth that could survive. "There aren't that many of those environments around," he observed. The organisms would have had to withstand the corrosiveness of water draining out from an acid mine as well as the salinity of water pooled on a salt flat. Knoll's findings are based on an analysis of the minerals sampled by Opportunity as it explored the Martian plain known as Meridiani Planum, where it landed just over four years ago. The analysis looked at the present-day chemical content and worked backward in time, using a computer model as a "gauge of paleosalinity," Knoll said. Other evidence comes from an analysis of one of the more recent pictures to come from Opportunity, a close-up of a rock known as Gilbert. The slab is covered with the blueberry-like stones that have been often been seen in Meridiani Planum. But it also sports what Knoll called "Cadillac-like fins" along an edge. He said those fins tell geologists that the rocks were formed by fluid flow but have been exposed to the elements for a long time. For Knoll, the bottom line is that even the rocks of Meridiani Planum, where Opportunity found its best evidence for ancient water, would have been no place for life as we know it. "By the time the Meridiani rocks formed, broadly speaking three and a half to four billion years ago, the planetary surface at Mars was ... my favorite three-word characterization is, 'arid, acidic and oxidizing,'" Knoll said. "That's not a very pleasant place to live, and it's a worse place to try to do the chemistry that is generally thought to have given rise to life on this planet." the image for a larger version. That means future probes would probably have to look elsewhere for evidence of life - either deep underground, or someplace where rock layers from the earliest epochs of Martian history were exposed, Knoll said. "Probably the best place to look for evidence of Martian life ... is in Mars' earliest history, the first 500 or 600 million years, the interval that precedes the deposition of Meridiani Planum," Knoll said. "We know those places exist. They've been characterized from orbit." The bad news is that Mars, like Earth, may have been hit by waves of extinction-level cosmic impacts during that time period - an epoch that geologists call the Late Heavy Bombardment. For one thing, Opportunity and its twin rover, Spirit, are still going strong after four years of operations on Mars. 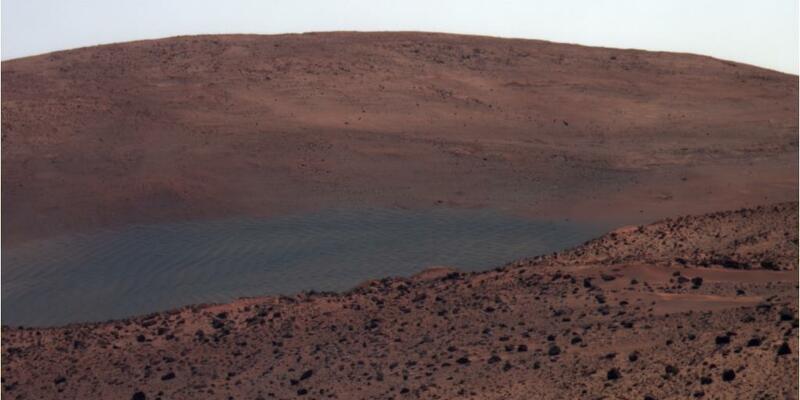 In fact, Cornell University astronomer Steve Squyres, the principal investigator for the Mars rover mission, noted that Spirit made its "biggest discovery" only recently. That discovery came when the rover kicked up a deposit of almost pure silica - which indicates that hot springs or steam vents were active during ancient times. For another thing, the Phoenix Mars Lander is due to land in Mars' north polar region in May. That probe is designed to dig into the cold ground and look for evidence of water and the other chemical building blocks for life. Finally, the Mars Science Laboratory, a rover far more capable than Spirit and Opportunity, is being readied for its 2009 mission to look for even more signs of ancient life. Richard Cook, project manager for the mission, said the list of potential landing sites has been whittled down to six promising candidates. "The real question is ... to try to find the place that not only could have been a habitable place in the past, but probably more importantly, [the place that] was able to preserve the signs that it could have been inhabited," Cook said. No matter how the current life-on-Mars debate ends up, the prospects are good for having a permanent presence at the Red Planet from here on out, in the form of rovers and orbiters, said Charles Elachi, director of NASA's Jet Propulsion Laboratory. "Think of them as robotic scientific stations which have been studying that planet for a decade, similar to the scientific stations we have in Antarctica. ... You're using them on a regular basis to understand what's happening, in this case, on another planet," Elachi said. To review the past four years of Red Planet odysseys, check out our "Return to the Red Planet" archive and our slide show of "Mars' Greatest Hits," as well as NASA's Mars exploration Web site.